Pinky Messchaert is a Utrecht artist. In 1979 she graduated as a Monumental Designer at the Art Academy in Utrecht. A few assignments from her time as a designer include a hanging object “Untitled” Central hall Antonius hospital in Nieuwegein (1984) and “Accidental meeting” shopping center Belcourt in Zeist (1996). Recently (2016) reinstated at the Van Stolberglaan roundabout in Zeist. After working as a monumental designer for a number of years, she decided to take a different course and chose to focus entirely on making free work. In the beginning years after the academy she mainly worked with wood, but the possibilities of wood limited her too much in her visual process. And in her search for other materials, she started experimenting with (old) iron. Soon she saw the potential of the material and from that moment on iron would be the basic material in her work. 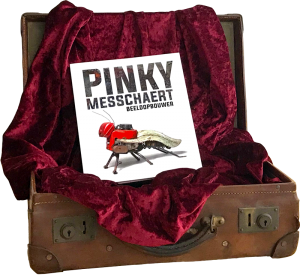 Pinky Messchaert is more of an “image builder” than a sculptor. Her sculptures are assemblages and are constructed from a variety of found pieces of iron. 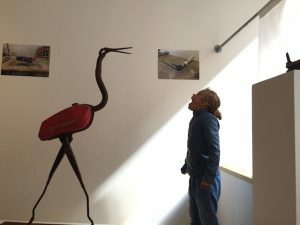 Her creative power is expressed in the characters she gives to her sculptures and the playful way in which she gives new life to previously discarded materials. Although her work was largely abstract in the early years, you can now call the recent work of Messchaert figurative. 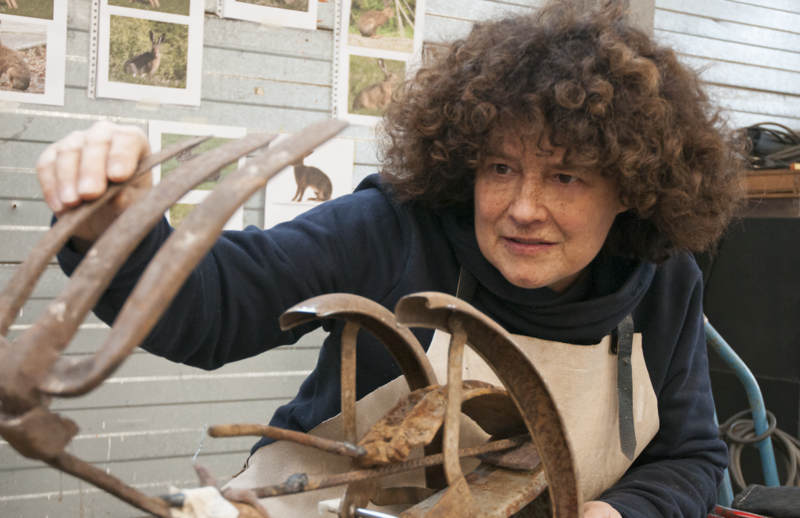 The fact that animals are often recurring themes in her work is not surprising given the location of her in the studio. An important podium for the work of Pinky Messchaert is her shop window in the Hamburgerstraat 34 in Utrecht. Many local residents, but also commuters on their way to work and mothers with children on their way to school, enjoy the work that Messchaert shows in her window every day. Her goal is to regularly place a new sculpture in her shop window and this is eagerly awaited by her followers.